Mr Santdeep Paun, Consultant Nasal and Facial Plastic Surgeon is the Medical Director of Symmetry Clinic. In the NHS, he works at and was the former Head of Department at St Bartholomew’s and the Royal London Hospitals, one of the biggest and well respected teaching hospital trusts in the UK. He performs complex cases there and, by reputation, am referred patients from other surgeons from within the region and other parts of the country. He is an honorary Lecturer at Queen Mary’s University, where he teaches students and is involved in clinical research with colleagues particularly In the areas of rhinoplasty and aesthetic reconstruction following facial trauma. Mr Paun has featured in Tatler magazine’s guide to cosmetic surgery and in their Best Doctor’s guide as one of the country’s best nose surgeons. Over the last 14 years or so as a Consultant and prior to that during training, his focus was always on nasal and facial plastic surgery. He trained in London with some of the best surgeons in this field and then spent the best part of a year doing a Fellowship in Facial Plastic Surgery spent between Amsterdam, Lyon in France, Toronto and finally one of the Harvard University affiliated hospitals in Boston in the US. He was privileged to have spent time in each of these places with surgeons at the top of their field and has spent the last decade or more taking that parts of each experience as a basis to perfect his own techniques. Indeed he now trains surgeons of the future and gets requests from visitors from all around the world to observe his work. Mr Paun has devoted a lot of time to academia and is regularly invited to present aspects of his work at National and International meetings. He teaches other surgeons in a variety of courses in facial plastic surgery and runs a very popular course in rhinoplasty surgery in London. He has been involved in looking after a Certification process for surgeons belonging to the European Academy of Facial Plastic Surgery (EAFPS). He set up and is the Inaugural President of the European Board for Certification in Facial Plastic and Reconstructive Surgery, which is dedicated to making sure that surgeons have to go through a rigorous and highly validated examination and peer review of their surgeries to ensure they are practicing at the highest level. This is done for the benefit to their patients by ensuring clinical excellence. Mr Paun did the same certification himself many years ago when it was in its infancy and was one of the first ever European surgeons certified in this way. He has published some of his work in peer reviewed journals and has written numerous chapters for a variety of Internationally renowned textbooks in his specialty. 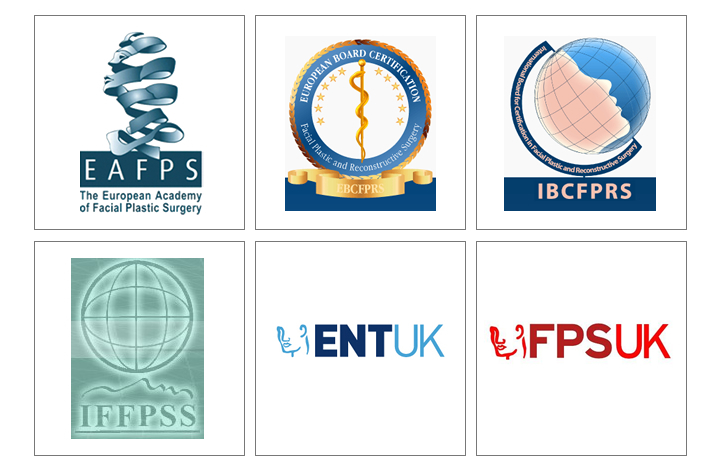 Mr Paun also serves on a variety of Boards both in the UK and Internationally and is currently on the Executive Boards of Facial Plastic Surgery (UK), EAFPS, International Board and International Federation. Mr Paun is a sought after speaker at a variety of surgical conferences and courses, both in the UK and internationally. Indeed, due to clinical commitments, he has to limit accepting the number of invitations he receives every year. In these meetings, he teaches a discerning audience of other surgeons about aspects of his work and in doing so has developed a reputation as being one of the UK's foremost Facial Plastic surgeons.